When I first met Michael Sohocki, the sommelier and I were enjoying a light brunch with a brand new sommbaby. We dined on farm eggs, Benton’s bacon, and sipped on Gruner Vetliner, as we often did in those days. Michael was in the process of opening his new concept, Restaurant Gwendolyn, and the sommelier was advising on the local wine trade: which distributors to utilize, wine reps to trust, and varietals to carry. Then the conversation turned to the menu, and I overheard something like,”I am not going to use any devices or materials that were not available in 1850.” I immediately turned my head. What? Why How can you do that? Wouldn’t you be in the kitchen all day? Michael acknowledged the challenge that lay before him, noting that he would have to come in early to bake the breads, breakdown the proteins, and prepare the daily menu. He wanted all of his food sourced within 150 miles of San Antonio, the way they did it in olden days. When Michael spoke about his ideas, I could see the passion behind his eyes. That was a year ago. Today, you can see Michael walking around the Pearl Farmer’s Market, gathering viable fruits and vegetables, talking with the locals. 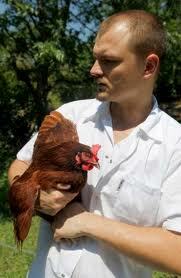 He is also a member of the San Antonio Chef’s Coalition, a band of Chefs determined to grow food awareness. At the Pearl, Gwendolyn has a booth that sells fresh sausage, baked goods, and this past weekend, whole seed mustard. 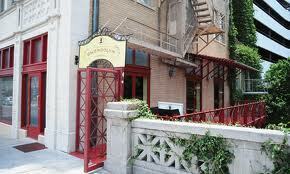 But Chef Michael’s restaurant is also capturing attention. Named new + noteworthy by Texas Monthly, one can sense he has come a long way since that first meeting. A few weeks ago, the Foodiemamas held a dinner at Restaurant Gwendolyn to bid farewell to our very dear friend, Tara from mama2Aidan. We first gathered in Alamo Heights to sip on cocktails from Olaf Harmel, the master mixologist and libations creator extraordinaire (rumor has it he will be behind a new bar soon at The Pearl), before we made our way downtown. Feeling calm from a stiff bourbons and vodka concoctions, we sat at a white linen table, surrounded by antique furniture and paintings. The menu was set before us, consisting of only two options: three course or five course meals. Because the offerings were so appealing on all levels, I chose the five course journey. 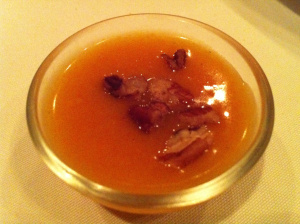 Our first taste of local heaven was an amuse bouche shooter of carrot puree, a touch of ginger, and crumbled pecans. My first reaction to the taste was the memory of my days on the elementary school playground. Texas Pecans donned the fence line of my private school in Selma; we would pick up the seeds, crack them, and eat them during recess. The carrot puree was a polar opposite to the dry taste of the pecan. 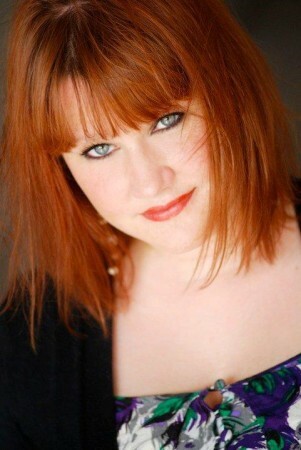 The tinge of ginger lingered in the aftertaste, arriving fashionably late, like a distinguished dinner guest. Needless to say, I was really looking forward to the rest of the courses. 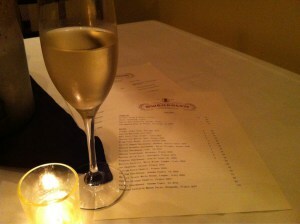 With regard to the sweet nectar of the vine, Restaurant Gwendolyn offered a variety of wines from diverse regions. Most notable from the list: affordability. We ordered Vidigol Vino Verde for $36, Chateau Goudichaud Bordeaux for $40, and a Domaine de Morchon Cote du Rhone (our favorite of the evening) for $48. While not the best varietals I have ever had, these drinkable wines were perfect for our foodiemama farewell get together. 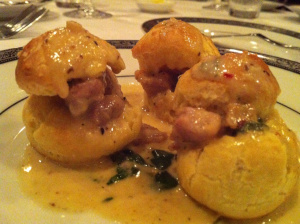 Next up: ham, spinach and cheese gougeres. Now I first discovered my love for these edible treasures this past Thanksgiving, finding it reasonably easy to blend the ingredients, freeze, and bake when needed. They make excellent hors d’oeuvres, light snacks, or breakfast bites. However, my puny attempt in no way replicates what Michael Sohocki created in his small Riverwalk kitchen. Thick chunks of farm raised ham came to our table smothered with spinach and dripping with Brazos Valley Cheese béchamel. From the very first bite, I was sold. Another reminder on why local is better. The taste is far beyond what you could imagine; I was sitting in a farmhouse, in Laura Ingalls gingham Prairie dress, eating food made from a cast iron skillet and a roaring fire. Out of all the dishes served to us at Restaurant Gwendolyn that night, this was by far my favorite. If you know me at all Now you know that I am a huge fan of offal, so I couldn’t resist ordering the chicken hearts and chorizo bruschetta. 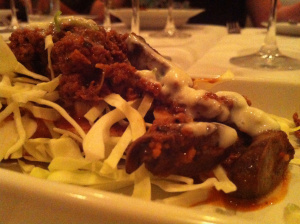 Topped with cabbage, scallion, and crème fraiche, the dish was incredibly flavorful. Being such a fan of organ meats, however, I longed for a highlight of the chicken hearts over a dish with vast ingredients. 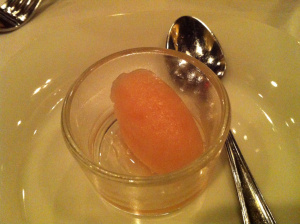 The palate cleanser (and marked third course) was a Texas Ruby Red grapefruit sorbet, harvested from Jim Killelea Orchards. Being a native Texan with memories of grapefruit breakfasts, this simple sorbet was not only clarifying, but mimicked the deep sweetness of the fruit, lower in acidity than most pink grapefruits. Clean deliciousness. 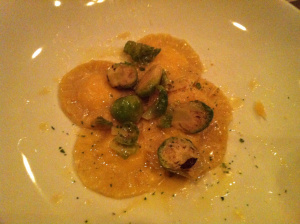 For my main course, I chose the ricotta ravioli, brussel sprouts, and buerre blanc. The other option for the evening consisted of roasted leg of lamb with pommes duchess. Normally I would go with the lamb, but this night I was going for a lighter meal. If you have eaten at any local restaurant worth its salt lately, then you know brussel sprouts have been all the rage this year. Chef Michael featured these beauties brilliantly, coupled with handmade pasta and ricotta. The taut texture of the vegetable complemented the soft raviolis, and sparked daydreams of dining in the Italian countryside, ensuing visions of golden fields ripe with rabbits, pheasant, and plentiful family gardens. Uncomplicated and unpretentious. 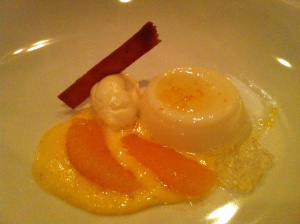 Our dessert course truly accentuated Chef Sohocki’s talents in the kitchen: orange panna cotta with champagne gelee and cinnamon shortbread. The cooked Italian crème, paired with oranges from G&S Orchards, gelled beautifully, and provided for smooth, velvety custard. The cinnamon shortbread bestowed a surprising kick to the plate, while the champagne gelee highlighted Chef Michael’s gastronomic abilities. The meal was vintage. The atmosphere romantic and wistful. The food farm fresh. Overall, the foodiemamas had a fantastic experience at Restaurant Gwendolyn, and while dinner is a definite must, lunch is an affordable, local option as well. Apparently one can get a sandwich served with local meats and cheeses, on homemade bread, downtown, for under $10. The sommelier and I will definitely be back. In the meantime, every time I hear the phrase “support local”, I will think of Chef Michael Sohocki and his quest for serving truly local foods. Every bite tasted fresh off the farm, and in reality, it truly was.